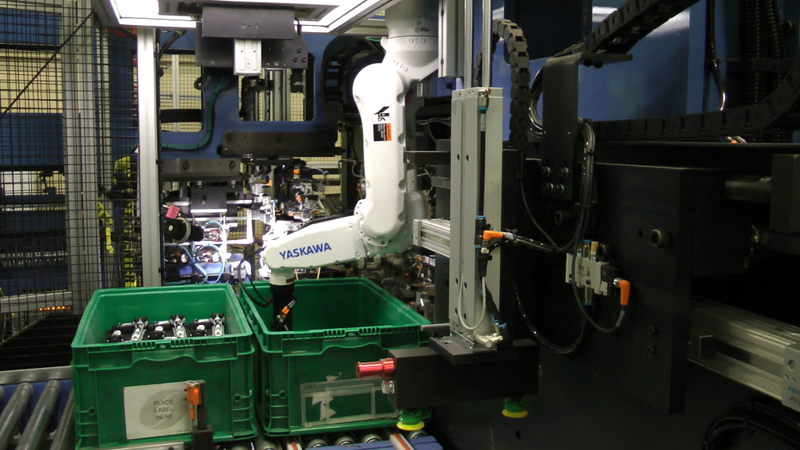 Programming robots to pick randomly oriented parts from shipping containers or bins continues to be one of the most challenging automation tasks, requiring extensive engineering knowledge and complex system design. Thanks to the growing capability of today’s cost-effective smart cameras, skilled automation integrators are able to solve bin-picking applications faster and more cost-effectively than ever before. 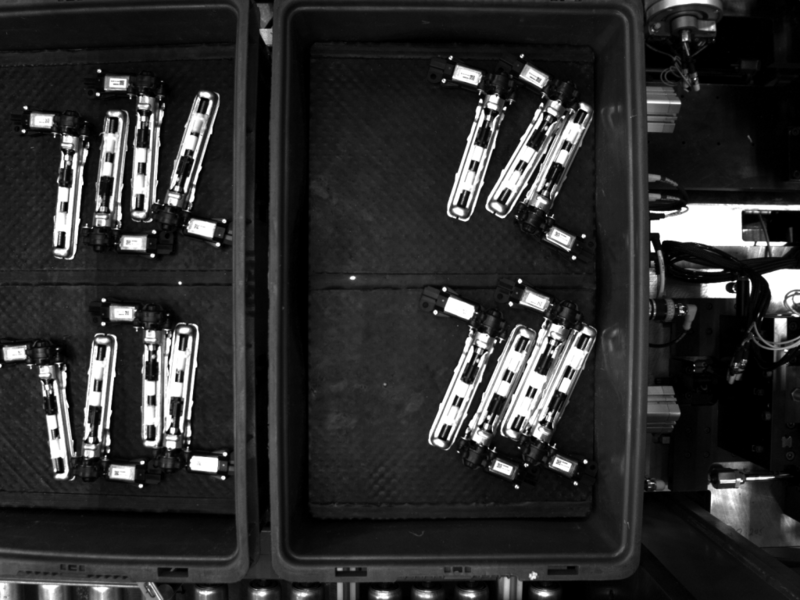 As a result, manufacturers are now able to automate more assembly applications than ever and achieve new cycle-time records while avoiding retooling and the additional costs of specialty shipping containers. SYSTEMATIX developed a compact VGR solution. Using a discrete distance measurement sensor, a Cognex In-Sight 8000 ultra-compact vision system with PatMax RedLine pattern-search capability mounted on a vertical slide, and a 6-axis robot, SYSTEMATIX improved the customer’s production accuracy while reducing cycle time and machine-tending requirements. “Partnerships with leading-edge technology suppliers such as Cognex allow us to offer best-in-class automation solutions to our customers,” says Rob Veldhuis, Director of Sales at SYSTEMATIX. The complete work cell utilized 7 Yaskawa robots to remove the actuators and wire mats from their respective shipping containers, place the parts into nests, and make all final assembly connections. 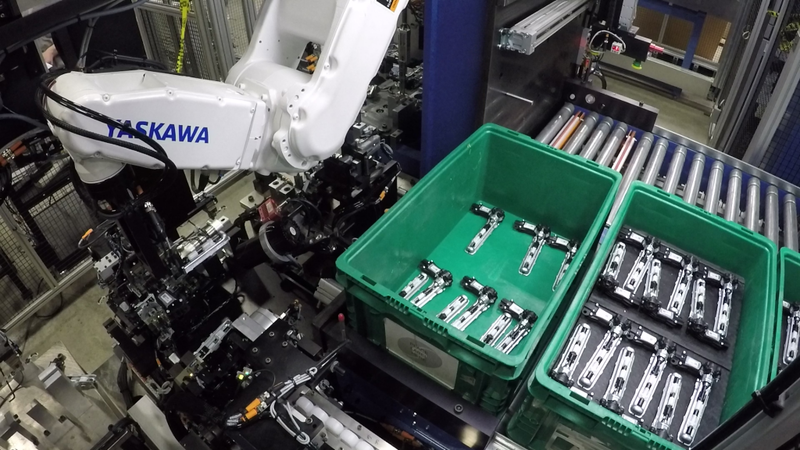 One of the critical challenges when designing this work cell was how to program a robot to reliably pick up randomly ordered parts with high accuracy and speed to meet new work cell cycle-time requirements of 5 seconds per assembly without having to redesign the shipping containers, which would add cost and impact other production steps. The existing containers, which are used throughout the production facility, include corrugated dividers to separate one layer of actuators from the next. While this cost-effective solution allows the same container to be used on multiple lines throughout the plant, it also means that actuators are not secured in the bins, which causes them to shift during transport. As a result, each randomly positioned part must be located before it can be picked up by a robot. Furthermore, because each bin has several layers, the vertical distance from the robot to the layer divider must be recalculated as the bin is emptied. A typical setup using a 3D sensor — such as a low-resolution, low-speed time-of-flight sensor, a laser-scanning triangulation sensor, or two cameras arranged in stereovision configuration — requires a lot of time to capture the image, send it to a separate computer or device for processing, execute advanced 3D analysis algorithms, and communicate the results to the robot. By reducing the problem to 2D part location and using a photoelectric distance-measurement sensor to provide the third-dimension (height) information, the final solution achieved much faster cycle times without the complexity and cost of traditional 3D machine vision solutions. To reduce the complexity of the machine vision program and further cut cycle times while constraining costs, SYSTEMATIX engineers paired an IFM Efector 200 photoelectric distance-measuring sensor and a Cognex In-Sight 8000 smart camera mounted to an IAI servo-driven slide. The photoelectric sensor measures the vertical distance to the bin divider. Once that distance is calculated, the slide moves up or down to maintain a fixed distance between the camera and the divider surface. This action eliminates the need to calculate the scale of the image the 2D camera sees as the bin layers empty and the parts become farther away. The Cognex In-Sight 8000 camera was chosen for part location and robot guidance because of its position as an industry-leading smart camera solution that includes high-speed image acquisition, best-in-class image-processing software, and network communication in a compact package. Additionally, the ultra-compact machine vision system comes standard with Cognex’s PatMax RedLine pattern-search algorithm — which can speed up part location by up to 10 times. The very first step in any machine vision application — and the one that usually determines whether the application will succeed or fail — involves locating the object within the vision camera’s field of view. This process is known as pattern matching. Pattern matching can be extremely challenging, as many variables can alter how an object appears to a vision system. To overcome these limitations, Cognex developed geometric pattern-matching technology called PatMax. This technology learns an object’s geometry using a set of boundary curves tied to a pixel grid and then looks for similar shapes in the image without relying on specific gray levels. The result is a revolutionary improvement in the ability to accurately find objects despite changes in angle, size, and shading. The latest PatMax iteration, RedLine, significantly reduces the time required to locate a shape, feature, or part within a cluttered image. 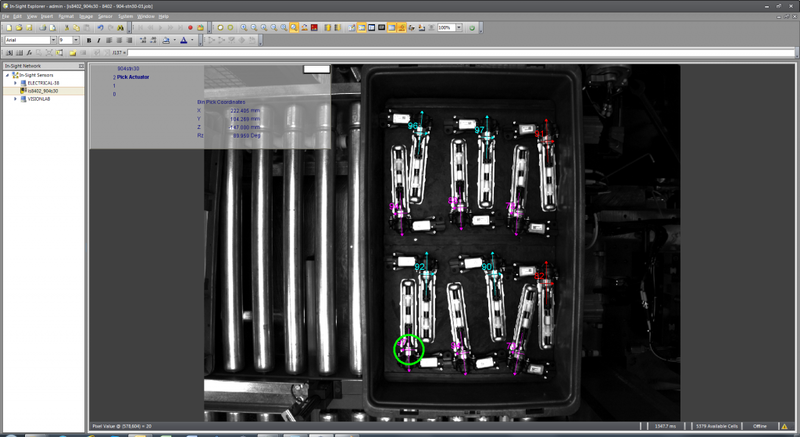 Using PatMax, the In-Sight 8000 camera in the bin-picking application quickly processes a part image and compares it to a reference image to determine each part’s orientation for the robot. Camera images measured in pixels are translated into robot pick coordinates in millimeters, and Cognex Connect software enables the camera to communicate the coordinates directly from one industrial device to another without intermediate processing. Through smart integration and the use of best-in-class smart camera solutions such as the In-Sight 8000 running powerful image-processing algorithms such as PatMax, SYSTEMATIX was able to achieve new levels of automation and speed for one of its biggest automotive customers. Previous article3D printing materials: Sustainable or not?